MamaInsomnia: A Good Looking Giveaway!--UPDATED!! Welcome to my first REAL giveaway! I am very excited to share this with you because not only is it a wonderful giveaway, but it's from a wonderful person. In High School, Jen and I borrowed each others clothes, made up dance routines and had sleepovers where Jen was kind enough to keep my eyebrows from looking like fuzzy caterpillars. So when we reconnected at our 10 year reunion it came as no surprise to me that Jen is still in the business of helping people look their best. 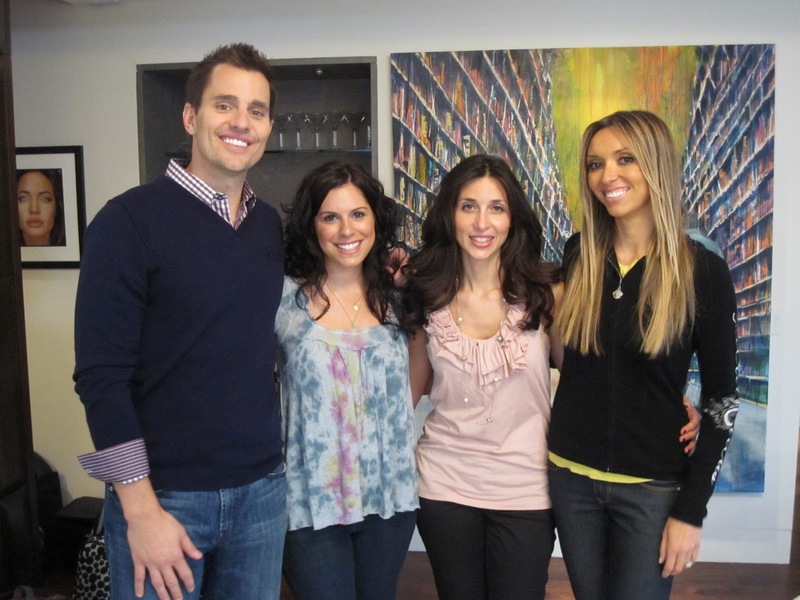 In addition to being one of Chicago's top make-up artists AND helping brides shine on their big day, Jen is also the creator of Veeve Cosmetics. 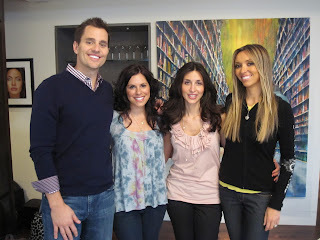 Here she is working with the Rancic's!! Jen is offering one lucky reader her credit card make-up palette (your choice of 2 color palettes- a $40 value) AND a $10 credit to shop at Veevecosmetics.com! The lip gloss in this palette-Peep- is my favorite!! This makeup palette is awesome because it is small enough to throw in your purse, diaper bag, or desk drawer in case you need a little on-the-go fix-up. I have the Brown toned palette and I love the lip gloss in it-Peep! The eye and cheek colors all work great together and wear beautifully. You can even use the dark shadow wet as an eyeliner! That's IT!! This giveaway is open to US residents only-sorry Canada- and will run until October 18th, 2010 12:00 am. A winner will be choosen at random on Octiber 19th. Please leave me a comment telling me which you did! 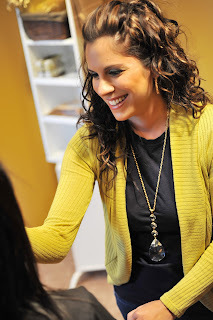 For all you Chicago area ladies, Jen offers amazing make-up services. She can provide one on one make-up lessons, or you can book one of Veeve's Soirees. Soirees are great for Bachelorette Parties, Showers, or special treat for a Girls Night. And if you or anyone you know is getting married check out Magnificent Brides for information on Jen's make-up services for Brides and Bridal Party's. I hope this counts b/c the links on her site are not working for me to view her products, but I have to say the very color palette you have pictured on your blog is EXACTLY what I need! The colors and everything...I have a nearly 3-year old LORAC set that is almost used up and it's my favorite tones for my skin. And I was one of your first followers was back in the day before all this Twitter-Blog-Hop nonsense! I also follow your blog on FB now. And I follow your friend's line on FB. So the link on here didn't work to veeve, so I went on their facebook site and found it from there. I'm always searching for a good lipgloss and really liked Pout and Zest. I also looked at the eyeshadows and honestly there wasn't a color that I didn't like--I think they would flatter anyone! I liked Choco, Charming and Perfect. I follow you, and I'm always hunting for the perfect mascara, and would love to try her Onyx mascara! I am a new follower..great giveaway. I follow Veeve cosmetics on Facebook. I follow Veeve cosmetics on Twitter. I really like the Elle lip gloss and the Twig lipstick. I love them all though. I like the Bang lipstick, that looks awesome! Now following your blog, although I've reading for several weeks and meaning to anyway! Now following Veeve Costmetics on Facebook! now following IMO on facebook! Main: I follow ur blog. My faves are the eyeshadows in Blank, Aged, and Charming. And the lipgloss in Pout and Gogo! I follow Anngee on twitter! Thanks for this awesome giveaway! I barely found it in time to get my entries in! Im crossing my fingers! Looks like a great line of makeup. What a great friend to have!